BEIJING - Thousands of academics, students, lawyers and rights group workers gathered on Friday on a typical windy winter morning to attend the funeral for Cai Dingjian, a renowned legal expert in China. Cai, 54, died on Monday at Beijing No 305 Hospital, one and a half years after he was diagnosed with stomach cancer. Cai had received chemotherapy and was sent to hospital on Nov 12, 10 days before his death, when his condition suddenly turned worse. A former government official and college professor, Cai is well known as "the first person of constitutional democracy in China", as he devoted himself to the implementation of the Constitution and better law enforcement. "Even on his deathbed, he told his friends repeatedly that despite difficulties constitutional democracy should be carried out," Wang Zhenyao, a close friend and chief of Beijing Normal University's One Foundation Community Research Institute, said on Friday. Another friend, Richard Balme, said "the determined yet gentle way he carried out his work" impressed him most. "His spirit is inspiring for scholars both in China and in France," the visiting French professor at Tsinghua University added. Cai served at the National People's Congress (NPC) Standing Committee secretariat, a branch under the country's top legislature, for more than 17 years before his resignation. Before he left and returned to college in 2004, he was the vice bureau chief at the NPC Standing Committee secretariat. "He made the decision because he needed more time and space to stretch his muscles and work out a system that can better ensure the implementation of the Constitution," Beijing-based lawyer Pu Zhiqiang said at the funeral. Before his death, he was director of the institute for study on constitutionalism under China University of Political Science and Law. He was also serving as a dedicated member of the Center for People's Congress and Foreign Legislature Study at Peking University. Along with constitutional studies, Cai also carried out field studies and social campaigns, which the legal fighter believed to be integral for better law enforcement. Lei Chuang, a college student and hepatitis B virus carrier in Shenzhen, South China's Guangdong province, came all the way to Beijing to pay his respects to the professor who held an anti-discrimination campaign last year for people with hepatitis B. "I didn't know him personally, but what he did was beneficial to all the people like me in China," Lei said as he tried to hold back tears, holding a poster reading "Thanks to Professor Cai for his efforts to reduce discrimination against people with hepatitis B". Some 5,000 people flocked to the mourning hall at Babaoshan Cemetery in the far west end of Beijing. 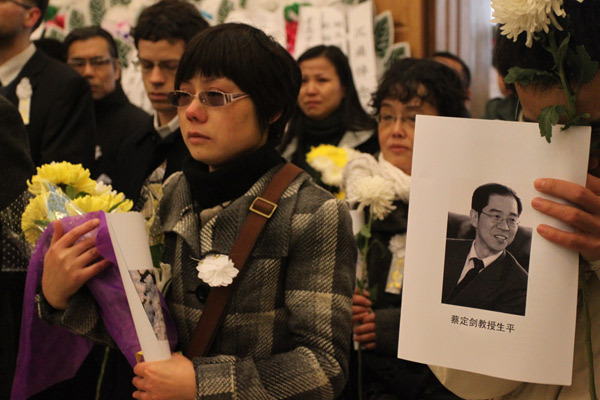 "The fact that his death has sparked so much spontaneous condolences is thought-provoking," Cai's niece and former assistant Wu Wei told China Daily through the phone. "His dedication and down-to-earth attitude is what society lacks, and which in turn has inspired a lot of people, including me," Wu said. Zhao Yinan contributed to this story.